Murray International has today reported its half year results for the 6 months to 30th June 2013 (link via Investegate). Shock, horror - they are in danger of failing to beat their benchmark index and spoiling the run of the past 11 consecutive years that MYI has been able to keep ahead of its benchmark (40% the FTSE World UK and 60% FTSE World ex UK). NAV total return for the half year was up 9.3% compared to 12.4% for the benchmark. I am sure Bruce Stout and his team will be hoping to turn things around during the second half of the year. NAV has increased by £228m to £1.315bn compared to £1.087bn at the same time last year (+ 20%). The first two quarterly dividends have increased from 9.0p to 9.5p (5.5%). I have pencilled in 43p for the full year which would provide a forward yield of 3.9% based on the current share price of £10.95. Interestingly, the company have been able to issue 3.8m new shares at a premium to NAV which has raised over £330m and which has improved liquidity. This should make the shares more attractive to fund managers and IFA platforms post RDR. “Coupled with unrealistic market expectations, it is clear why emphasising capital preservation is so important. Widespread portfolio diversification via investment in high-quality companies with robust balance sheets and solid dividend growth remains at the core of overall investment strategy, and offers the best prospect of achieving the Company's investment policy". More on this following the FY results. I started this blog on 21st February 2013. A month later I wrote a short piece (here’s the link) mainly about the stats so thought I would update at the 6 month stage. Page views has now just reached the 30,000 mark which far exceeds my initial expectations. The average per month is now around 6,000. I have recently added a tab for most viewed article - current front runner is Investing for Income (part 2) followed by Asset Allocation. Other popular articles are SIPP Drawdown Review - First Year, Compare Fund Platforms & Brokers and Investment Trust Portfolio. I suspect many were the subject of a mention by Monevator! The main sources of referring sites continue to be Retirement Investing Today, Monevator and Money Saving Expert - many thanks! I am enjoying writing the blog and I know from some of the messages via the contact page that a few people are finding some of the posts helpful so that is very rewarding. Unfortunately, in the past couple of months I have found it more difficult to find sufficient ‘quiet time’ to write the quality of articles I would like and also there is the unsettling effect of a pending house move. Hopefully all will be resolved over the coming weeks. As ever, slow & steady steps….! 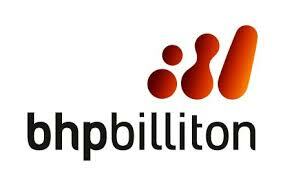 As the largest mining company in the world, BHP Billiton is essentially a one-stop commodity shop. It is also unique among the mining majors in having exposure to the oil price – over the last year the group generated just under 20% of its revenues from black gold alone. BHP makes over half of its profits from mining commodities - particularly iron ore, coal and copper so it is extremely exposed to demand connected to manufacturing and infrastructure e.g. airports, railways and housing, particularly in emerging-market economies such as China. What's more, the fall in profits announced today is largely due to falls in the price of iron ore and coal in recent months. Despite weakening global demand for base metals and the ongoing crisis in the euro zone, BHP Billiton remains one of the world's most powerful companies. The full year results announced today show that profits fell 19% to $19.2bn (last year $23.7bn) from total revenues of just under $70bn ($72.2bn 2012). The proposed final dividend is 59c making a total for the year of 116c - an increase of 3.7% on the previous year. At the current share price of 1890p, the yield will be around 3.9% (subject to exchange rates). Dividend cover has fallen from 2.9x in 2012 to currently 1.9x. Over the past 10 years, dividends have increased from 26 cents to 116 cents - a CAGR of 16%. “BHP Billiton's strategy of owning and operating large, long life, low cost, expandable, upstream assets diversified by commodity, geography and market remains the foundation for our sector leading shareholder returns. To extend our track record and create a more productive and capital efficient organisation, we have concentrated our efforts on those world class basins where we enjoy economies of scale and a competitive advantage. We achieved a thirteenth consecutive annual production record at Western Australia Iron Ore (WAIO) and a 28 per cent increase in copper production at Escondida (Chile) in the 2013 financial year. In addition, liquids production at our Onshore US business increased by 76 per cent and our Queensland Coal (Australia) operations returned to full supply chain capacity during the period. Because of the cyclical nature of the business, holders of BLT should always expect it to be a bit of a rollercoaster ride. I have held this in my ISA since 2007 and topped up in late 2008 at around the £11 area - 18m later and the price was over £25. Throughout this price fluctuation, the dividends have continued to steadily increase so for me, this is very much a case of ignore the price and focus on income. Personal Assets would not be an obvious choice for a seeker of income however, from the point of diversity and based on a good track record to date, it suits me just fine and I have today made an initial purchase at £343 (that‘s not a typo)! PNL is run expressly for private investors. Its investment policy is to protect and increase (in that order) the value of shareholders' funds over the long term. The trust became an independent in 1990 and was managed for many years by Ian Rushbrook until his untimely death in 2009. 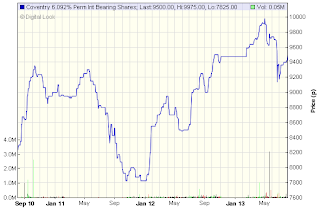 During his stewardship the PNL share price rose over 500%. As an independently managed investment trust, Personal Assets had total freedom to use gearing (i.e. borrowing to leverage its position), or liquidity (i.e. holding funds in cash rather than investing in the stock market) as appropriate. In some circumstances the trust would continue to hold individual company shares, while hedging its position on the overall market using derivatives. "We view our level of liquidity or gearing as probably the most fundamental decision we have to make on behalf of the shareholders of Personal Assets -- much more so than which individual stocks we should buy or sell." During the run up to the so called ‘dot com’ technology bubble, Rushbrook was moving into cash as early as 1996. 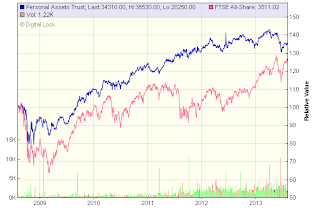 At its height the trust was 50% cash and was able to outperform the market during the downturn of the early 2000s. In 2009 PNL engaged Sebastian Lyon as its new adviser. He runs Troy Asset Management which he established in 2000 primarily to manage the affairs of the late Lord Weinstock, and from whom he inherited his conservative style of investing and focus on wealth preservation. Personal Assets Trust is unique with its commitment to the protection of shareholder wealth combined with its definition of ‘risk’ - PNLs definition is focussed on the ‘risk of losing money’ as opposed to most other trusts where risk is defined as volatility of returns relative to a benchmark index. "… Personal Assets' investment style tends to lead us to outperform in falling markets and lag in sharply rising ones, and the last year has been no exception. Over the year to 30 April 2013 our net asset value per share ("NAV") rose by 4.8%, while our comparator, the FTSE All-Share Index, rose by 13.6%. Since April 2000, the trusts NAV has risen in 9 years out of 13 compared to the All-Share's 7. When it did fall, it did so in each case by significantly less than the All-Share. Between April 2000 and April 2013, NAV rose by 76.1%compared to the All-Share's 12.9%, so PNLs investment style succeeded not only in reducing risk but also in increasing long-term reward. Returning to income - which is not what this investment trust is about as the current yield is £5.60 per share or around 1.6% - the trust has the option to withdraw cash on a fixed quarterly basis via its ‘Cash Income Option’. So for those who are able to invest a sizeable sum, rather than specifying a rate of return, investors are able to withdraw a specified sum (minimum £500). So, with say a holding to the value of £50,000, an annual income of £2,000 could be taken - 1.6% dividends and 2.4% from capital. In most years, this rate of withdrawal would be more than covered by capital appreciation and dividends so should be a sustainable longer term option. Unfortunately I am not (yet) in a position to take advantage of this facility so will need to be content with the quarterly dividend distribution! According to the latest quarterly report, equities make up around 44% of the portfolio - largely USA and UK. They include Microsoft, BATS, Nestle, Coca-Cola, GlaxoSmithKline and Johnson & Johnson. The rest is mainly gold at just under 12% and assorted government bonds 44% - so fairly defensive! I like the look of this trust for its conservative/defensive qualities - and the fact it is different to most other investment trusts in my portfolio. I also like the concept of not losing money. I am reminded of legendary investor Warren Buffett’s investing rules - Rule 1, never lose money. Rule 2, Never forget Rule 1. For those wanting to explore PNL further, here’s a link to their website. The quarterly reports make a good read. I started to become a little suspicious of management spin when, earlier this year, the seller of hot pies and pasties blamed poor sales on cold weather. They have today issued their interim results for the 6m to end June 2013 and say trading in recent weeks has been affected by the heatwave! Although total sales have increased, like-for-like sales declined by just under 3% and profits declined 28.7% from £16m in 2012 to £11.4m. The management are looking to 'refocus' the business over the next 2 - 3 years - Chief Executive Roger Whiteside, who took up the reins in February said: "We will spend the next two to three years reshaping the business as we build the platform for long term sustainable profit growth for the benefit of shareholders, employees and the wider community." 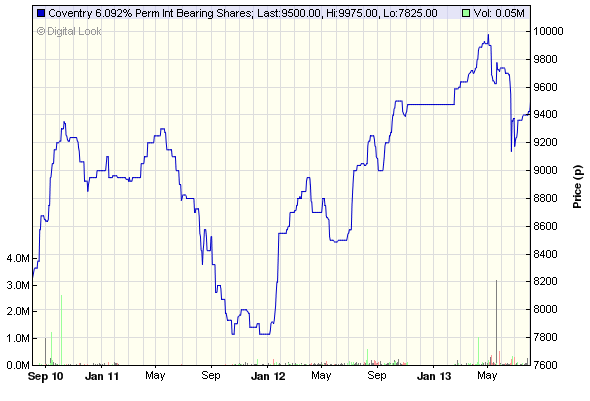 Earning per share for the 6m period declined from 11.9p to 8.5p. They have held the interim dividend payment at 6.0p and cover falling from 2x to 1.4x. They are proposing to open a further 20 to 30 new shops this year and I think this focus on the high street may be part of the problem as it seems less people are venturing out and the trend is for more and more shopping to be carried out online. Greggs was a 'half' purchase in 2012 since when I am now sitting on a capital loss of 15% at the current price of 410p. I really cannot see much upside with the stated strategy for the immediate future so I have decided to cut my losses, accept the original purchase was possibly a mistake and to off-load this morning and look for better opportunities elsewhere. I like this mutual building society and have been a holder of their PIBS in both my ISA and SIPP for several years. I updated the blog following their final results in March. They have recently issued half year results to 30th June 2013 (link via Investegate). Profits are up once again by 18% from £52.8m last year to £62.2m. One of the key indicators of strength for any financial institution is its core tier 1 ratio - for the Coventry, the figure is the highest for any top 10 building society or mutual lender at 22.5% - but a reduction from the figure of 24.1% reported at the same point last year. They have maintained their high credit rating throughout the financial crisis and are the only major high street bank or building society not to have been downgraded over the past 4 years. Savings balances have increased to a record £20.9bn - up £821m. After the problems experienced by the Co-op Bank in recent weeks, its reassuring to see another solid set of figures from the Coventry. The mid-price for CVB is 95p giving a current yield of 6.4%. They are due to be called (repaid) in June 2016. Back in early March, I set out my portfolio of core investment trusts used to generate income. Some are held in my SIPP which has been converted to drawdown - some are held within my ISA and some are held in both. Over the past couple of months I have added Finsbury Growth & Income Trust (and again) and secondly, Vanguard All World High Dividend ETF so its probably a good opportunity to update the portfolio with these additions. I may use the Vanguard ETF as a benchmark against which to assess the progress of the rest of the portfolio. The total includes accumulated dividends paid so far this year. 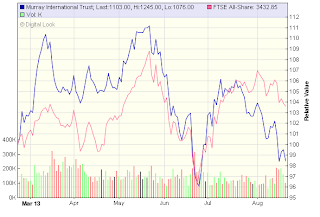 Apart from the additions, I have taken the closing prices for each investment trust at the end of 2012 and allocated a nominal sum of £2,000 to each. With the exception of fixed income trust New City High Yield, all are in positive territory. 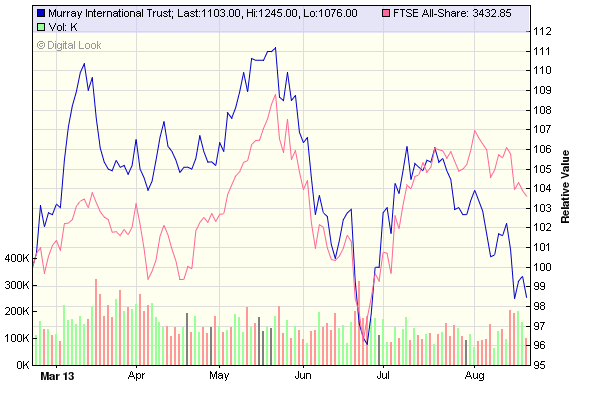 The best performance is from smaller companies specialist Aberforth with a gain so far this year of 32%. I will update on progress at the end of the year. Hopefully the good run will continue - but you never quite know what's around the corner! LED lighting specialist Dialight has seen a boost to its share price following the announcement today of a $1m contract for its new Cellphone Tower Remote Monitoring and Lighting system. Roy Burton, CEO said: "These orders demonstrate the progress that Dialight has made both in developing our new Cellphone Tower Remote Monitoring and Lighting system and selling our products and services outside of the United States. We are encouraged that our new system will drive growth in our Obstruction business in North America and further orders should see a return to growth for this business." The sp has been a little volatile in recent weeks following the trading statement in June forewarning of contract delays in the USA . As N. America accounts for nearly 70% of sales, it is not surprising this announcement will reassure investors. Hopefully this will be the first of many new orders in this sector of operations and that the obstruction lighting division will be back on track in the remainder of 2013. At the time of posting the sp is up 6.5% in morning trading at £11.70.